I have a running list of changes I want to make to Cotton vs. Thug in the hopes that I do somehow stumble upon that Time Chamber and can get them all done in time for the review on the 24th. I did squeeze in some small touches to the existing animation. For instance, I added some ease-in and ease-out on the knife raising shot, and the thug now adjusts his thumb. He blinks more and pauses more, too. That being said, there are myriad changes I’d like to make, but I won’t complete the film by the deadline if I preoccupy myself with tinkering. So for now, I have a running to-do list of edits to implement when I can get around to them. I still need to speed up the timing of the scrapped slo-mo blood drop shot. The pool of blood should also ripple a little bit more, truth be told. When the thug pauses to take a breath, his chest should puff out more. The same is true for his smug laughter shot. Instead of repeating the blood drop action, I’d prefer it if it dribbles down from Cotton’s cheek cut instead. Oops! I’m harping on things I want to fix. There are things I’m very pleased with as well! Look at the timing and settling when the thug whisks up the dagger! Not too shabby, right? The thumb adjust, while only a small detail, adds to the dagger raise, too. Animation is in the details. Still images move when we carve out little moments of action. Anyway, I’m rambling. I’ve gotta say that this project has my brain humming and whirring with excitement and creativity in new, exhilarating ways. On Monday, I was chit-chatting with a peer about my inability to sit through shows and movies with too much horror, suspense, or downright conflict. She then asked what I was working on at the moment, and I replied that I was animating blood dripping from a dagger into a pool on the ground. The irony didn’t occur to me until she pointed it out. With this newly discovered confidence, the week seemed to slip by seamlessly. I finally got around to hammering out a theoretical framework for a long overdue assignment; put together a thesis thread flow (holy cow, my animation skills have come a long way from the flip book animation at the bottom of this page! ); and cut together my most cinematic animatic yet. Incidentally, I also picked up a visually striking book on animation production design from the library. The illustrations are mesmerizing. The notes are robust. There’s just one small sticking point: out of a list of 41 directors the author suggests studying, there is not a single woman. That further shored up my resolve to wring as much animation knowledge as I can from this program. 화이팅! I’ve gone back and forth on the short order for the opening scene of Cotton vs. Thug, but I believe I’ve settled on “Knife -> Pool -> Knife.” Originally, the blood was supposed to drip into the pool in slow motion, but I think I will remove a few frames to sync it with the dripping knife. Maybe I’ll stretch the drops more to speed it up as well. I’m satisfied overall with what I have completed so far and am confident that this will be my strongest film yet. This upcoming week is shaping up to be an exciting one. Maria and I are going to a folklore panel on fieldwork and ethnography on Tuesday afternoon. I’m hopeful that I can learn from the presenters’ experiences collecting research from far-flung locales and apply it to my TTRPG cultural probe. Additionally, I’m looking forward to Breanne’s thesis defense on Monday because 1. I am very happy for and proud of my friend, and 2. it will be illuminating to see how a defense plays out. Oh, yeah, and I’ll also keep animating. Because I’m an animator now. Thanks to my peers’ wealth of animation knowledge, the critique on Tuesday was eye-opening. Because I was so close to Watch ‘Em Move for so long, my vision became myopic, precluding me from noticing obvious errors. I’ve checked out Thomas and Johnston’s The Illusion of Life from the library on three separate occasions. I can recognize the twelve principles of animation when I see them. I’ve explained the 180° rule to other people. And still I broke the rule and did not take advantage of the principles. The animation may be fluid, but there isn’t a story there yet, and the characters do not yet breathe life. Rather than be discouraged, though, I’m eager to drill down into the animation I have completed to instill that story and inject that life. I rewrote my Phase 2 proposal to reflect this determination. I will center this final project of the semester around the intentional exploration of the following principles of animation: anticipation, slow in and out, arcs, timing, spacing, and exaggeration. Maria suggested that I focus on one of the three sequences for this project; as such, I decided to build a narrative around Cotton the ork punching the drekky thug. There is already a built-in question of why that woman is punching that man, so I drew rough thumbnails on paper and began to digitally board an expanded story. Tesha encouraged me to take my time on the animatic, and I now understand why they are so crucial for timing. Out of curiosity, I started roughly setting frames out of the half-finished boards I had, and I was shocked at how long shots must be to be readable to an audience. For instance, the expanded punch sequence (tentatively titled Cotton vs. Thug) begins with blood dripping onto the ground. Even knowing that that is what I’m seeing, it still took about 96 frames for the action to land for me. I haven’t even finished the animatic, and the whole animation is already significantly longer than Watch ‘Em Move was in its entirety. I’m shocked and thrilled to learn how much timing alone tells the story. Outside of the world of my computer screen, I attended the monthly lunch hosted by the Center for Folklore Studies. I’m grateful that Mary Anne and Maria suggested I explore the possibility of establishing a research connection with the center because I seem to have truly found my people. When I introduced myself and my TTRPG interests, approximately one-fourth of the people in the room spoke up to say that they, too, played TTRPGs. Incidentally, I registered for Dr. Kaplan’s Philology of the Vernacular course that morning; Dr. Kaplan also happens to be an avid tabletop gamer. Go figure, huh? There seemed to be connections to my thesis thread everywhere I turned this week. The Center for Folklore Studies have already sent a number of papers their department has written on the subject of TTRPGs. 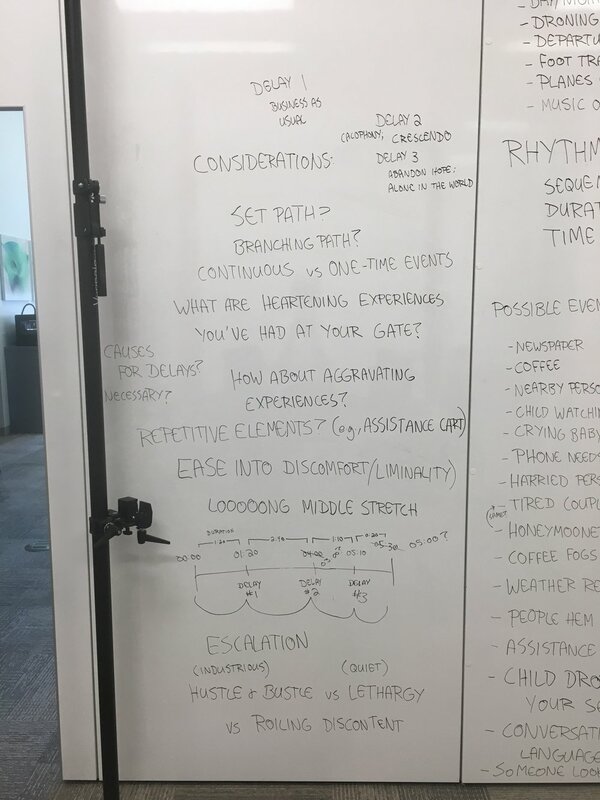 The reading in Calvo and Peters’ Positive Computing this week touched on gamification, which I realized is the overarching concept that binds TTRPGs to lateral thinking for social design. And even in my leisure time spent playing Pathfinder with my friends last night, I mulled over the geopolitical consequences of our attempted coup in the capital of Kiergard. It’s everywhere, dear reader! Gamification. Lateral thinking. Discrete space. Cultural probes. Design ethnography. Animation. Tabletop roleplaying games. IT’S EVERYWHERE. 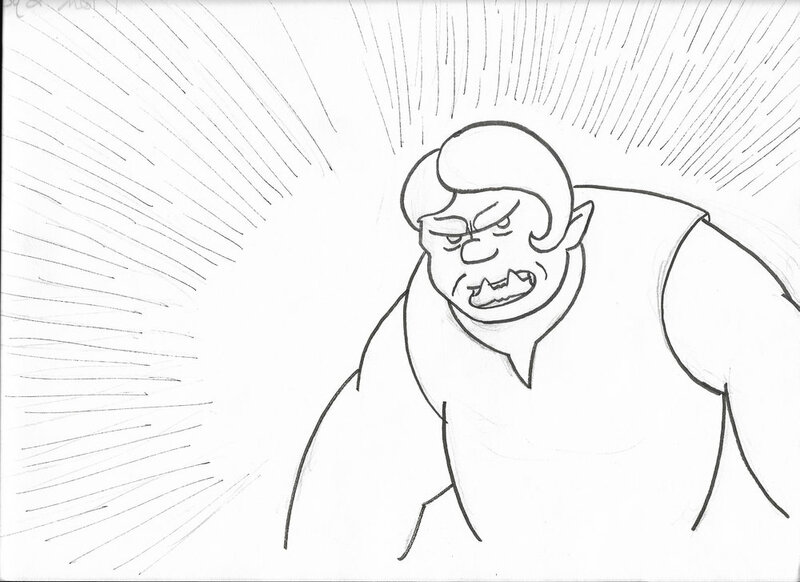 I will finish timing out the animatic tomorrow and begin the rough animation on Tuesday for Cotton vs. Thug. I also have quite a few papers from folklore folks through which to parse. And finally, I am certain I will reflect on the progress I have made this year as I write the thesis flow section of my first year review. I feel hopeful about it all. 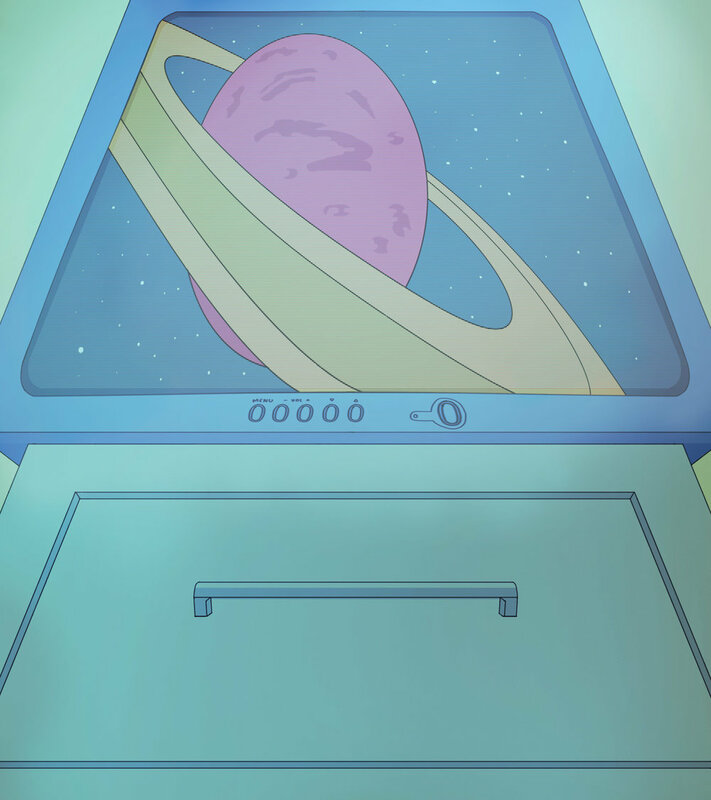 In many ways, this was a week of playing catch-up (e.g., significant amounts of grading, cleaning and coloring backgrounds for Everyone Here Speaks Sign), but I fortunately did not have to scramble on my DESIGN 6400 animation. Cleaning animation is considerably more painless than roughing it, so I had the luxury of compositing the final sequences with time to spare. Because I did have extra time, I gave into temptation and added some color and a placeholder background to the punch sequence. TTRPG players often meet in private settings and may not feel comfortable allowing an outside observer to document their personal experiences. However, in a society accustomed to photo-documenting the particulars of their daily lives, I believe it would be much easier to convince study participants to photograph, draw, and journal their experiences. This potential wealth of documentation could prove worthwhile indeed. To capitalize on this flash of insight, I emailed a professor in the Center for Folklore Studies in the hopes of establishing a connection with their department. I inquired about people with whom I might meet to learn more about ethnography, oral histories, and field research. I also reviewed the fall Folklore course offerings to determine if there is a class I could take to formalize my possible research approach. I’d say I imagine I feel how Winsor McCay must have after completing Watch Me Move (1911)—an upswell of pride and accomplishment at breathing life into his 2D creations—but truthfully, I think my mood may be more akin to his audience’s. I say that because I am flabbergasted that I managed to get my player characters (PCs) from old Shadowrun, Mutants & Masterminds, and Pathfinder campaigns to actually move. This is the most complicated hand-drawn, frame-by-frame animation I have yet completed, and I am excited to push these skills further in future projects. Now that I have watched it repeatedly, I see that there are still some timing issues to address, particularly in the hop sequence. Additionally, I want to add color, value, and backgrounds when I have time. This week, I will begin to plan both Phase 2 of my DESIGN 6400 animation and my First Year Review in earnest. I will meet Maria on Monday to watch a short film that may provide insight for how to meaningfully portray the permeability between players and the persistent shared universe their character avatars inhabit. I will also review the dialogue I recorded at the beginning of Phase 1 to determine if I can use it for Phase 2, or if I need to pare it down or re-record it. Halfway through a lively, good-natured meeting with Mary Anne on Monday, we stumbled on what exactly I’ve been trying to articulate all semester. It may very well be the “what” of my thesis. The “why” and “how” still need some polish—impassioned speechifying regarding the inherent value of TTRPGs is one thing; a succinct research question is another. Scott and I met on Tuesday to pick up the conversation, and we theorized how in-game space and out-of-game space are distinct yet permeable. The two influence, inform, and bleed into each other. I wonder now if animation can serve as the connective tissue between them. The only consistent choice I’ve made this semester is the choice to continue changing my mind about what I want my research to look like. Each time I pick up a new thread, I feel palpable relief that now I’ve found how I will devote the rest of my time in this program. Having said that, now I really, really do think that now I’ve found how I will devote the rest of my time in this program. I have to remind myself that my purpose here is to learn the theories and tools to answer one particular question. That answer won’t—and isn’t expected to—save the world…the real world, anyway. Who knows? Perhaps it will save the next persistent fantasy universe my fellow TTRPG players and I co-create in our next campaign. I am relieved I decided to distill down my five-week animation to its essential form because, boy howdy, the deadline fast approaches. Fortunately, I completed the roughs for the final sequence. I could be naive, but animating a frog hopping up a hill seemed more nuanced and complicated than animating a cloud of teleportation residue. The timing is imbalanced, and I should push the form by implementing more squash-and-stretch. 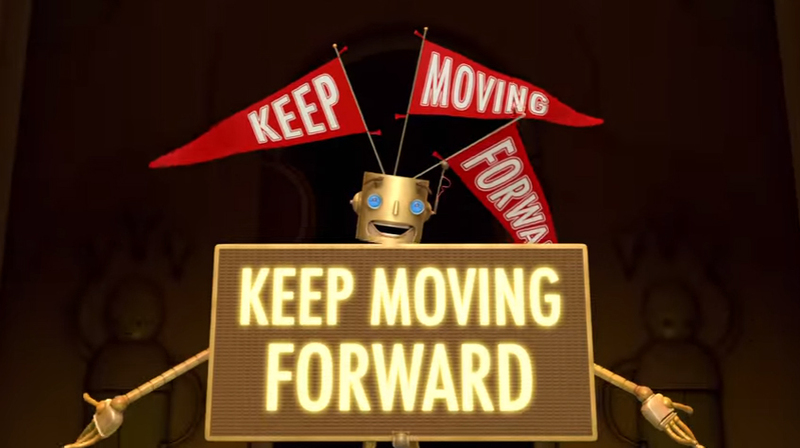 Again, though, I felt the need to keep moving forward. My Spring Break doesn’t align with my wife’s, so I will be staying here for the school holiday. That’s all well and good, though, because I plan to camp out at ACCAD until Unfettered shines. It’s been tough stringing two good days together this week. Personal, professional, and academic stressors have left me spent. I’m ending the week in need of a win—and, no, stumbling upon that legendary item I’ve been dying to find in Assassin’s Creed: Odyssey doesn’t count. These concepts feel like inroads into how I can tell a story about TTRPG players. Plus, I did animate a hopping frog. Neat! Maria and Mary Anne shared contacts in the Folklore Studies Center, so I plan to email them to ask more about personal interviews and field research. How cool would it be to interview TTRPG nerds from all over? I love stories! I love talking to people! 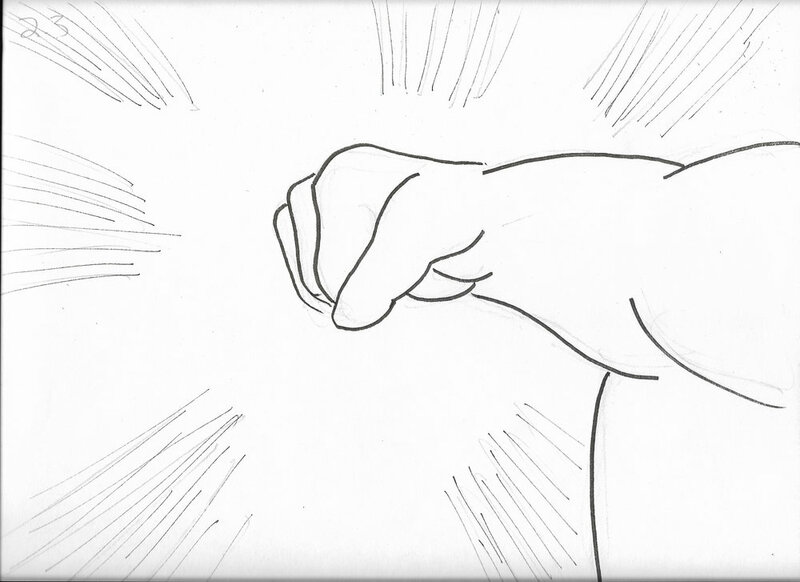 On top of that, I will knock out the rough animation for the teleporting superhero. I’m nervous for the progress review on Thursday, but I’ll do my best to remember that I’m still learning. I was gunning to work on the rough animation for Unfettered, so I was admittedly somewhat perturbed on Tuesday when the 2D animators were asked to meet in the classroom. Thank goodness there are people who have the patience to pull me out of my own head, though, because our subsequent conversation was illuminating. We watched Foreign Body (Marta Magnuska, 2016) as a springboard to discuss how to move our respective animations beyond the realm of conventionality. I knew the medium can be used to depict things that would be otherwise impossible (or very expensive) to do in live-action, yet I wasn’t taking advantage of its fluidity or dimensionality. I left the classroom mulling over how I could use animation to push limits. Instead of diving back into rough animation, I instead used the remainder of Tuesday afternoon to dig through animations that emphasize movement. I mulled, dear reader. I mulled a good deal. And then I tossed the script for Unfettered. I’ve said again and again that I want to use this project to practice making forms move, but I once again found myself in the weeds of editing audio and trying to wrangle together a satisfying narrative. This particular project doesn’t need that, though. I will instead use the time that would have been spent chopping up dialogue to finagle it into a film to laser in on morphing one series of lines into another. 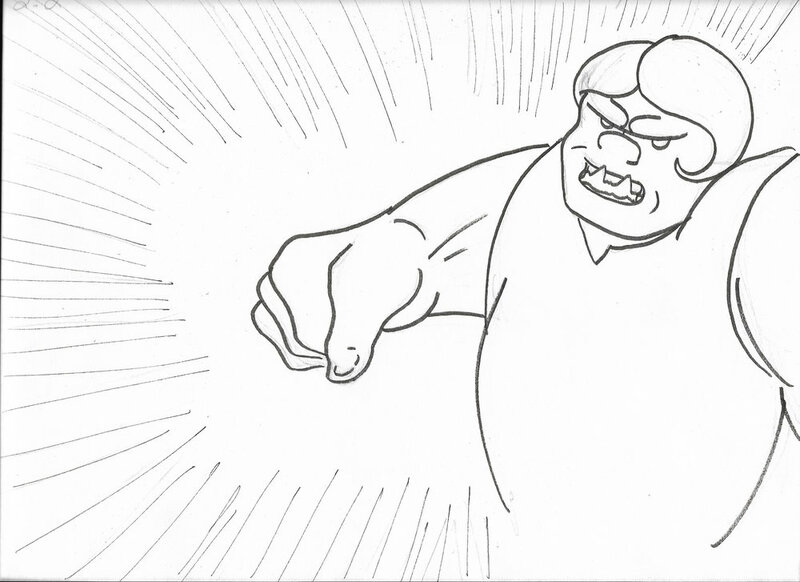 The speed lines generated by the half-orc’s punch will shift into the superhero teleporting across the screen. The wisps she leaves behind will undulate into a frog hopping onto a parapet. And finally, the lines composing the bricks of the parapet will click into place to form a d20. Though some of my progress will now been left on the cutting room floor, I am pleased with my first steps towards drawing pose-to-pose character animation. Cotton the caterer from a long-retired Shadowrun campaign punches some drekky thug! I need to add more speed lines for impact, but I feel that I’ve crossed my first major hurtle. Rather than add those speed lines or obsess over whether or not I should add more in-betweens to my current sequence, I will instead move on to the teleporting hero sequence. Once I’ve finished the initial roughs of my three major sequences, then I can work on the transition sequences and futz over small details. Once again, it’s the movement that matters. My wife often teases me about my tendency to take something I’ve read or heard from a perceived expert as gospel truth. I will unquestioningly fold this information into my worldview and adjust my behavior accordingly (e.g., I once read that brushing your teeth with your non-dominant hand improves brain function, so I now brush right-handed). Maria challenged this tendency when I came to her once again plagued by self-doubt regarding the shape of my exploratory project. She encouraged me to center skill-building in conjunction with my information gathering, so that I might become the expert of my narrow field of focus. Following the precedent set by our first assignment this semester, I recorded the voiceover for Unfettered in order to lay the boards on top to determine length. When I sat down to build the animatic, I was surprised to find that I did not have nearly enough images to fill the length of the dialogue. I need to devise more animation, but I am uncertain about what I should add. Fortunately, I had more luck with my reading this week. Now that I am resolved to pursue TRPGs as my research thread, I have approached our assigned readings with this in mind. Chapter 3 of Positive Computing centered methods of measuring well-being. Of particular note was the authors’ assertion that there is a dearth of socio-emotional training occurring in contemporary American education. This grabbed my attention because TRPGs are inherently a socio-emotional exercise. Similarly, Calvo and Peters state that teaching with well-being would entail “[efforts] to improve relationships and to develop emotional awareness and regulation, self-control, and healthy values” (Calvo and Peters, 49). One could describe TRPGs with the same language. I also began reading sociologist Gary Alan Fine’s seminal study of the medium, Shared Fantasy: Role-Playing Games as Social Worlds. Fine posits, “Each gaming group interprets, defines, and transforms cultural elements in its sphere of knowledge into the cultural framework of an imagined society” (Fine, 2). Both readings point to possible connections between adolescent populations, identity exploration, and TRPGs. Collecting information from experts has been painless; creating my own visual vocabulary has been less so. There is little time for self-doubt, though, so I will forge ahead, fill in the holes in my animation, and more seriously consider Maria’s prescient advice that I may want to decrease the frame rate in my final product. I woke up on Tuesday morning with the realization that I had no desire to make a game for our upcoming five-week project. Once again, I was falling into the trap of appeasing some perceived notion of what I should be doing with my graduate program. I was trying to be a people-pleaser, but there wasn’t anyone to please. No one demands that I study liminal spaces, or affect theory, or game design. The agency is mine alone. With that in mind, I once again reaffirmed that I do, in fact, want to create animations. I set off to school determined to revise my five-week proposal to reflect my actual interest: collaborative identity exploration through the medium of tabletop roleplaying games (TRPGs). Before I threw my old project proposal out the window, I wanted to make sure I had something to say in an animation about TRPGs. I wrote a one-page script and spoke to Breanne about its viability as a five-week project. She passed on invaluable advice about the first pass of the script. Breanne pointed out that I was telling my audience what the animation should be showing. It’s funny: I took three separate creative writing courses in undergrad and continue to write vignettes about the various Pathfinder campaigns in which I’ve played, yet when it comes to animation, I consistently forget to show, not tell. After revising the script, I put a number of books relating to the social constructs imbedded in TRPGs on hold at the library. Later, Tesha, Noor, and I traded our revised proposals back and forth. Again, until I read Tesha’s animation proposal, I hadn’t even thought about including independent animations in my contextual background materials; I had just presumed scholarly texts alone could provide sufficient backing. (Sometimes, I feel like I have to relearn how to be a student all over again.) I tracked down video reference for the distinct animation present in each of my sequences. Afterwards, I scribbled some thumbnails likely indecipherable to anyone save me. The scene in my script that I am most anxious to animate involves one character punching another, so I skipped ahead and completed the boards for it in order to get it out of the way. As a fledgling animator, I haven’t yet developed a tried-and-true workflow. That much was made apparent when Maria pointed out the glaring gaps in my proposed production calendar. I witnessed a production firsthand at The Simpsons; I’m a bit embarrassed it didn’t cross my mind to make room in my calendar for storyboards, animatics, and editing. Upon reflection, I created an asset list akin to the list my team and I used to create Ter(li)minal in the fall. Maria and I also discussed in our meeting the limitations of a five-week production cycle. 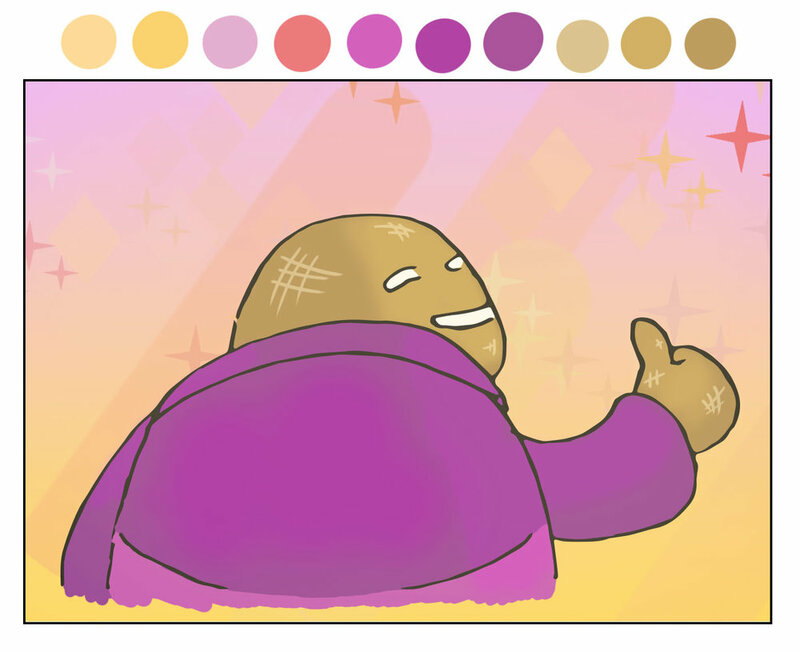 I know I can effectively ink and color an image. If I truly want to push myself, though, I need to center movement in this project. The upcoming week is vital to the success of this project. Looking back at 1994, I understand that my initial hemming and hawing about lighting techniques and software compressed my overall timeline. In order to have as much time as possible to foreground the movement present in each sequence, I will complete the storyboards, animatic, and animatic this week. While I am pleased with the recorded dialogue in my previous project, I intend to give this animation even more polish. As such, I emailed Professor Oliszewski for advice about voice acting. We worked together last semester on Sad Sack, and I recall marveling at his self-assured techniques for recording dialogue. Polar vortexes, car troubles, unexpected work shifts, and sudden snowfalls really hampered the flow of class this week. Even still, I had productive conversations with Scott and Kyoung on Monday, as well as with Maria on Tuesday. I have this log of a thesis thread, and I’m just now beginning to whittle it down into something workable and worthwhile. Last semester, I started with a so-called “academic” topic and tried to hack it into something in which I could find personal enjoyment. This semester, I’m doing the opposite; because I already find the concept of pen-and-paper RPGs so meaningful, I think I will achieve greater success. In other news, Stephen spent a good half hour before Computer Animation II on Tuesday helping me fix my truly ghastly character model. He also bumped back the due date and is offering a help session this brisk Sunday morning—I’m sitting in ACCAD waiting for 9:00AM to roll around as we speak. Finally, while I have a fair bit of trepidation about my 1994 animation (Are there enough moving images for it to qualify as animation? Why does my voice sound like that? Why did two of my three drawing tablets decide to give out on me the same week we got snowed in in German Village? ), I am pleased with the quality of the illustrations I have completed for the assignment. German Village has lovely, quaint cobblestone streets. German Village also has street parking. These two charming quirks mean that salt trucks can’t salt, and plow trucks can’t plow. It was difficult and stressful making it to campus, so I spent more time working from home. Home is also where my needy dog and cat live. It was a touch challenging trying to be productive when the cat kept leaping onto the keyboard, and the dog kept whining for attention. All in all, this has not been my most productive week on record. The biggest success of the week was setting up one of the ACCAD Cintiq monitors next to Breanne’s station, so I could begin work on the background design for Martha’s Vineyard without having to shout across the room at her. I began a pencil rough for an exterior establishing shot yesterday, and it was gratifying to work together so closely. After struggling with my 3D character model for Computer Animation II most of the afternoon, there was something particularly therapeutic about the straightforward process of putting down lines. Breanne provided invaluable insight about loosening up the line quality and driving the movement of the illustration towards the focus of the scene. Additionally while I was a little frustrated with myself last week for fussing around too long on an individual frame of my 1994 vignette for Design Studio, I realized that I was on the right track when I submitted the rough animatic on Thursday. The actual animation for the piece will be fairly limited, so I think it is worthwhile to present clean, polished layouts. Developing a narrative-based project that supports said answers. I am also disappointed with my dismal output in Computer Animation II. I spent both Friday and Saturday afternoons determined to complete my model for a simple, bipedal cartoon character, but the head resembles a horrifying creature from the deepest bowels of hell, and the body is a potato. The assignment is due Thursday; the outlook appears grim indeed. I am looking forward to a meeting with Kyoung and Scott tomorrow afternoon regarding my new research focus. We share a common love for tabletop games, and I know that they have explored the nuances of collaborative design in their own work. I hope to glean insight from them regarding my own foray into the intersection of design and play. Furthermore, my peers are a lively bunch who never fail to ask thought-provoking questions, so I look forward to their feedback about my concept map. I missed the first week of classes because I was finishing my internship in LA. As a result, I was nervous I would limp out of the starting gates and begin my semester riddled with stress. Thank Hylia, my professors were instead incredibly accommodating. I ended the week confident that I caught up with my peers. In addition to catching up on schoolwork, I also needed to return to my gym routine. Our gym has a television monitor on every exercise bike, elliptical machine, and treadmill, so I use our workouts as a way to squeeze in additional artistic learning, too. While jogging, I watched tutorials on utilizing perspective grids in Photoshop and creating lighting effects in Premiere. Perspective and lighting are the two defining elements of our memory moment project in Design Studio (DESIGN 6400). They also happen to be two elements I struggle to articulate in my work. 1994 is the tentative title of the 17-second short I am making based on a memory I have of watching television while sitting in my father’s lap. It will utilize strong perspective, variations in lighting, and a flat line quality. Because it is a first-person vignette, three-point perspective will be key to make the world seem large in the eyes of a child. The memory is a fuzzy one, so I plan to replicate this through a series of somewhat “moving stills;” changes in lighting will be vital to provide enough movement to this time-based project. Finally, the memory embodies an anti-narrative. It’s a snapshot, a flash, a moment almost entirely devoid of context. Using the consistent line quality found in ligne claire will flatten out the images to push this anti-narrative quality. Outside of 1994, I have also had pleasantly surprising successes in Computer Animation II (ACCAD 5003). Initially, I was unsure if I would even take the course because of how much I struggled with computer animation last semester. However, upon the advice of my department chair and some animators at The Simpsons, I decided to try my hand at Maya once more. The first day back was overwhelming, to be sure—Maya does not seem to be the type of software that one can casually pick up again after a hiatus. I came in early on Thursday, though, and I hacked away at our head modeling exercise until I felt I had reached something of a detente with the fickle program. Professor Conroy asked us to sketch character references for next week, and I am cautiously optimistic that I will be able to bring Evan Evans to a third dimension. A year ago, I met Professor Maria Palazzi to discuss the Digital Animation and Interactive Media (DAIM) graduate program at The Ohio State University. When I expressed my interest in pursuing animation professionally, she offered to pass on the email of one of her former students who now works in the industry as a Production Coordinator for The Simpsons. I reached out to the contact to enquire about summer internships. Unfortunately, the production had finished hiring summer interns, but the coordinator provided invaluable advice about my resume and encouraged me to apply again in the winter. I had better luck the second time around—I flew out on December 3 for a six-week stint in Los Angeles as an intern on The Simpsons. I have never met a more affable, down-to-earth group of people than the production team at Fox TV Animation. 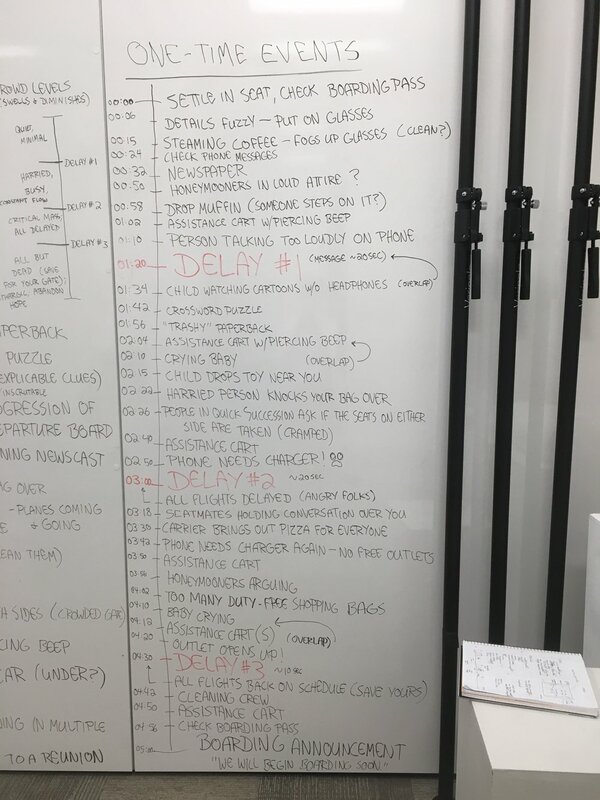 I was invited to sit in on meetings at every stage of production and to have one-on-ones with directors, producers, and heads from every department. I had the opportunity to pull reference materials for the animators working on The Simpsons: Tapped Out, as well as the chance to sift through scripts found in various directors’ garages and attics in order to catalogue them in the script archive. Not only did I learn to navigate FileMaker, the industry-standard database for production materials, but I also got to play around with The Simpsons’ proprietary versions of Storyboard Pro and Toon Boom Harmony. A person and their dog return home to find that the building elevator is malfunctioning in a particularly peculiar manner in this 2D collaborative animation for Hand-Drawn Animation Techniques. When devising the credits sequence, our group didn’t bother trying to pin down our individual roles—because we each tackled a bit of everything. For my part, I nailed down the initial art direction, drew half of the storyboards, created the color key, and completed numerous animation sequences. Of the sequences I completed, I am most proud of the Great Wave scene, as well as the scene in which the person finally becomes fed-up and goes bananas. Three flamingos seem mightily suspicious in this 3D animation made for the final project in Computer Animation I. At the outset of this semester, I thought it prudent to maximize architectural precision and minimize polygonal faces. As I understood it, I needed to strive for “clean” geometry. The first iteration was, arguably, very clean—but it also lacked personality. I rebuilt the scene from the ground up, and I prioritized lopsided architecture, personal touches (e.g., a soccer ball stuck on the roof, poorly hammered nails), and a vibrant aesthetic. In Unknown Heights, a person unexpectedly leaves behind the quotidian to go on a reality-bending trip. I sought to illustrate the mundane giving way to the fantastical in this color key. A self-absorbed sad sack spills out his woes to an indifferent convenience store employee in this cutout animation made for Hand-Drawn Animation at The Ohio State University (ACCAD5001). I want to give a sppecial thanks to Professor Alex Oliszewski for his voice acting chops, too. In addition to writing the script and completing half of the storyboards, my roles entailed capturing the cutout animation, compositing the footage, mixing the sound, and cutting the final film. My team and I are developing a cutout animation in my hand-drawn animation class. Sad Sack is the story of a self-absorbed, heartbroken sad sack who spills out their woes to an indifferent cashier at a gas station. I wrote the script, drew a number of the storyboards, and recorded the scratch dialogue. Here is the latest iteration of the exterior scene I am developing for Computer Animation. 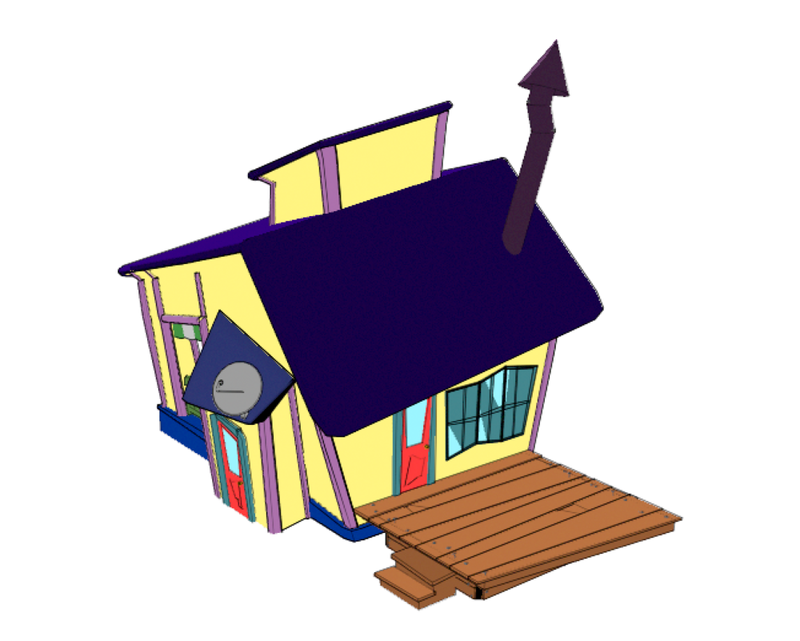 Previous versions of 42 Macaroni Blvd were a little stiff and formal, so I attempted to push the cartoonish aesthetic with unrealistic angles and a toon shader. I plan to add gutters, shingles, and a yard in future updates. If I get really ambitious, maybe I’ll add some kids’ bicycles haphazardly parked in the grass. I’ve also included the original illustration on which I am basing this project. Our assignment in Computer Animation (ACCAD5002) was to model and rig a character that will later be placed in an exterior scene. The exterior I am developing is 42 Macaroni Blvd, the house where Evan and his family live. They’re a busy, boisterous, and playful bunch. Plastic yard art fits their father’s offbeat sensibilities. 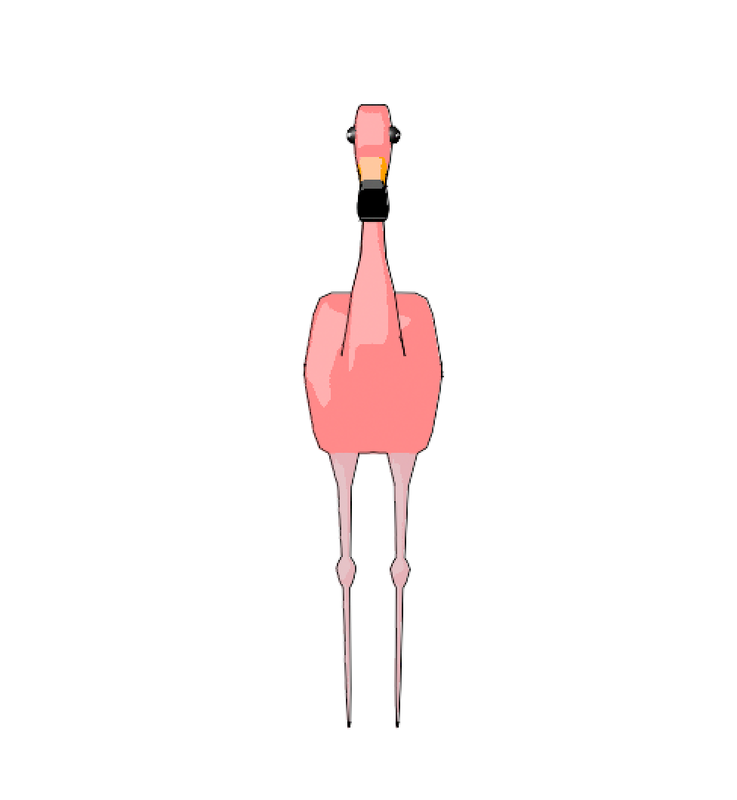 As such, I created a plastic flamingo (affectionately named Richard). Evan Evans is the type of person who meticulously folds the sleeves of his shirt before putting it on. He knows he’s the smartest person in the room, and he’s not humble about it. His confident stride, upturned chin, and indomitable smirk reflect this. I completed this walk cycle for my hand-drawn animation class. In Ter(li)minal, my team sought to explore the bounds of constructed timelessness and placelessness found within an airport lounge. We built this experience in VR, so that the participant may become an observer of the amorphous passage of time in a liminal space. My role entailed establishing the initial concept, narrative flow, and sound design. This prototype was completed for the Foundational Design Studio (DESIGN6400) at The Ohio State University. Here’s my take on the classic bouncing ball test for my hand-drawn animation class. The primary breakthrough I encountered was with the sound design. Initially, I had considered Cabbage Catastrophe complete after I had finished the animation. However, the sound effects elevate the believability of each bounce and sword slash. Plus, the three piano notes at the end introduce a sudden, over-the-top sentimentality. My team in Design Studio began work on our first project in earnest. I established the concept (see below), as well as the rhythm chart (see above). "The experience of waiting for a plane in an airport lounge is one of constructed timelessness and placelessness. It is a true liminal space, where the boundaries between the social, personal, and touristic spheres diminish—and at times merge. We seek to recreate this experience in VR. The user will become an observer of the surreal nature of time as it compresses and expands around them as they sit at a departure gate. The ‘landscape’ will alter according to the time of day and the amount of foot traffic. The user can participate in this ritual with quotidian interactions with their environment that will influence the amorphous passage of time."